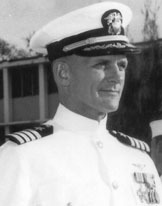 First Commanding Officer of the USS Gambier Bay (CVE-73) was Captain Hugh H. Goodwin, USN. Although he had moved on to another assignment a few months before the ship's last battle, "his strict training while we were preparing for combat, his insistence that everyone aboard do every job right every time, made us fight our ship at her best and also saved many lives," according to Anthony Potochniak, an aviation technician aboard ship. 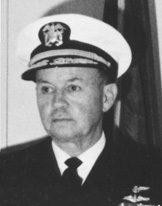 Captain Goodwin continued his Naval career to become Vice Admiral. Commanding Officer of the Gambier Bay in her final action. After skillfully handling his ship while under virtually constant bombardment from a Japanese fleet for more than two hours, he had to order "Abandon Ship" when his carrier was finally "in a sinking condition, surrounded by three enemy cruisers firing at point blank range," as his official ACTION REPORT stated. 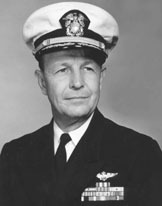 He retired from the Navy in 1954, as a Rear Admiral and died of a heart attack in 1960. Retired 1959 after 35 years of service. 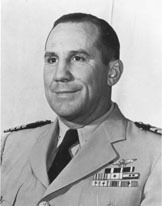 Commander of VC-10, the Gambier Bay’s composite squadron (fighter and dive bomber planes), was Edward J. Huxtable Jr. He was born in 1913 in Douglas, Ariz. His father owned one of the town’s first drug stores and was active in civic affairs, including aviation promotion. Douglas had the first international airport in the Americas. In 1933, it ranked as one of the 10 best airports in the U.S. When Huxtable Sr. became the town’s postmaster, he helped place Douglas on the first, regularly scheduled, federal airmail route. Captain Henry Burt Bassett attended Davidson College and the University of Florida where he earned his Bachelor of Arts degree. 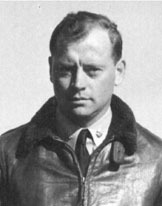 Captain Bassett entered Flight Class 158, Naval Air Station, Pensacola, Florida on 15 October 1940 as an aviation cadet. After successful completion of training, he was commissioned an Ensign on 1 July 1941. His first duty station was NAS, Corpus Christi, Texas as a flight instructor and ground school instructor. at the right was designed by Ensign R.B. "Bob" "Tuffy" Barrows. 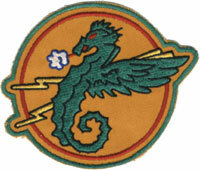 Mr. Barrows was a Torpedo Pilot in Composite Squadron VC-10.